3 Beds 2 Baths 1 Partial Bath 2,313 Sq. ft. This charming 1925 Tudor offers a versatile floor plan with master suites up or down. While there have been many wonderful updates, the home maintains both charm and originality. 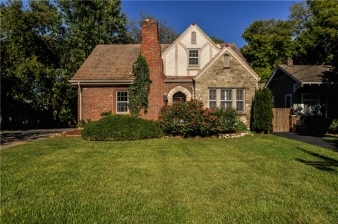 Gorgeous hardwood floors, crown molding, built-in cabinetry, beautiful galley kitchen with granite countertops and stainless appliances, arched stone gas fireplace, deep lot, level yard, mature trees, 26X25 deck, privacy fence, spacious unfinished basement and a lifetime tile roof are just some of the features! The den/office could also serve as a 4th bedroom. Fabulously located just minutes from Green Hills, Belle Meade, the Greenway and the new transit system to Downtown Nashville—it doesn’t get much better than this!